4.45 points at 11 votes (rank 820). 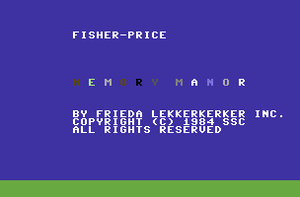 Memory Manor is an educational game which was released by Fisher Price on cartridge. Wee Willie is a window cleaner whose task is to clean the windows of a house and at the same time has to take notice of the inhabitants' wishes. Some of the residents wish for a window cleaning, others in turn are not happy about his work and do not want their windows to be cleaned. Additionally, Willie has problems with the amount of water in his bucket. There is only in it as much as he needs to clean all required windows. If he cleans a wrong one, he will be out of water later. Furthermore it is raining, so he has to keep in mind who lives where. 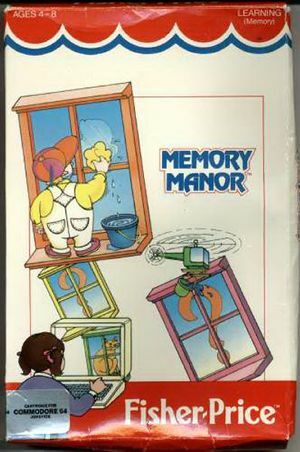 Memory Manor is based on the principle of "Memory". The house is shown from the side. 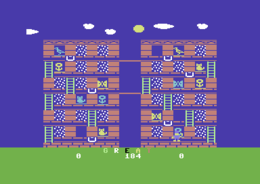 The player takes over the control of Willie who can walk left/right, climb ladders and clean windows. At the start 3 white containers per side need to be filled with the help of a helicopter (place helicopter over water container and pull joystick forwards while pressing the fire button). After each 3 containers are filled, the rest of the containers disappear. Then Willie needs to be transported to the façade with the helicopter (place helicopter in front of Willie, press fire button, transport him to the façade, press fire button). During these actions you can take a look at the inhabitants of each window. The player has to remember now behind which window happy people live or where bonus items are and clean those windows after a rain shower. To be able to clean windows he has to first get water from a white container (place Willie in front of container, press fire button). As Willie has only a limited amount of water, he must not clean too many other windows, depending on the difficulty grade. The game is over when Willie has no water any more. A round ends when all correct windows were cleaned. If you have cleanded all the correct windows and there is still water left in the container, you get points for each container that is still full. The display at the lower border of the screen shows for each part of the house how many items/persons that you need to find (and therefore are correct) are still hidden behind the dirty windows. In the middle you see the current score. Per correctly found window and container that is left you get one point in round 1, two points in round 2, three points in round 3 etc. 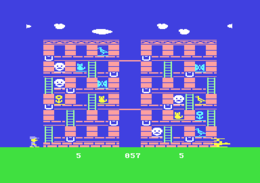 There are altogether 5 rounds per level, whereby in a higher level you start with more windows to be found. The number of windows that you need to clean rises by one per round. With the contents of one water container you can clean five windows. If you get a wrong one, the number of windows that you can clean is reduced. H.T.W: "By the simple graphics and the sound only consisting of a tone sequence it looks little to nothing at the beginning, but gets more fun when you have found out the game principle. 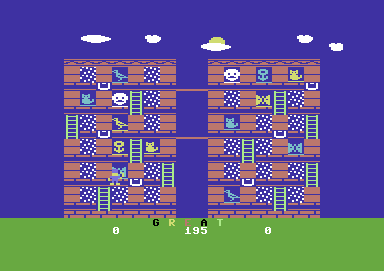 Not bad for kids and there is no harm for C64 freaks (whose brains by now also start to rust a bit) to play this game regularly..."